I was surfing on SEO blogs the other day and I ran into a super little SEO campaign management tool called Raven. I clicked on their video tour and I was very impressed with the functionality of their platform and the way they created their help system. It seems like they thought of just about everything in beta, and rolled it out finished the first time. Of course I have not used their system yet, but I will try them out as soon as I start another SEO project. As the video went on I caught little details here and there. The link manager was the first detail I noticed. It gives you standard categories for your links and allows you to record paid link transactions. This stuck out to me as very intuitive, even though I have never purchased a link in my life. To a seasoned professional, that one could be a no-brainer, however it struck me. It served as an example a well thought out, deliberate attempt to make their system as useful possible. Of course that’s what every online business wants to accomplish, but this is probably the best model I have seen. The video goes on to describe more features, SEO tools and what they do. The coup d’etat was when they described their help platform. Each page has Help and Feedback links on it. Clicking Feedback will make a text box appear that allows you to send bug reports and feature requests. The Help link gives you help related to the page that you are currently on…brilliant. My goal is not to give Raven’s services a rousing endorsement. Raven’s little video just made me think about the customer service model I worked on during the years I worked for Name.com. I worked in the customer service department at the ICANN accredited registrar, Name.com for a bunch of years. I went to my interview in a small, two room loft above Paris on the Platte, just off 15th st in downtown Denver. There were 10 people working there at the time: Randi, Scott, Ben, Dave, Sam, Michael, Owen, Reggie, Ravi and Bill the CEO. The company was nearly 2 years old at the time, and I was hired to help Ben and Randi in customer service so Scott could begin to concentrate on other things as well. Nearly everything we did was manual, and almost nothing was automated. Registrar transfers, authorization code requests, account transfers, fraud prevention, etc. It was pretty much all done by hand. It could get to be very tedious at times, but it was a great way to learn about regulations, rules and processes involved in domain name registration. It wasn’t quite a well-oiled machine, but we knew what we were doing and there was something new to learn each day. When the platforms were created for Name.com, and their separate, sister company DomainSite, the system was clunky, and not very scalable. As we grew, we had to change the way that our system worked. That became a chore. The Developers were already busting their asses on other stuff, and bug fixes, feature requests and other tweaks were sometimes difficult to get done. At times it was frustrating; for both us in the department, but more so for the customers. In my four years there my biggest pet peeve was answering the same questions over and over and over again. If I had a nickel for every time I explained how to change your name servers, via telephone and email, I would likely have made more then the sum of my quarterly bonuses. When Name.com overhauled its interface, and became the flagship company (prior to that, DomainSite got more attention), one of the things I worked on was rewriting the Help section. My goal was to help develop a system that made it so customers wouldn’t have to contact us. The problem is that I had no idea how to do it, and not create more work then what Development was able (willing) to do. Make the Help section bigger? Put an FAQ link in the main menu? It appears that Raven has begun to solve that issue, and better than I have seen so far. Of course highly specialized SEO monitoring and strategy management tools is a vastly different customer base than a domain name registrar. Their customer base is much less broad, because their product is much more specific. I’m sure it is easier to know what a customer would want in such a specific field. The model is a slam-dunk however. It offers their users very precise, automated help without having to contact support. 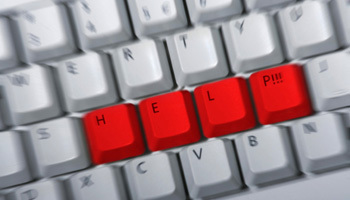 If you do want to contact support, they are right there; One click away and on every page. I just wish I had thought of it while they were remodeling the Name.com web site. I am not trying to compare the the way the two companies do business, or trying to sound critical of Name.com. During the time I worked at Name.com we went from a two year old start-up, in a drafty brick loft, to finding ourselves within the top 30 ICANN accredited registrars in the industry (there are almost 900 ICANN accredited registrars worldwide). I simply saw the way that Raven created their Help system, and it just happened to be the idea I was looking for.